Ireland, promoted two years ago in Gasawa, had to play The Netherlands.The Irish started fresh and scored the first goal of the match. After that the Dutch took over the game and won easily against Ireland. Not that Ireland played badly but the difference was the individual skills of the players. Germany had to face Scotland. After 17 minutes the Germans scored their first goal. But then the attackers of Germany failed too many times. So finally in 31st minute they scored their second goal. In the second half the Germans netted 5 more times in the second half. Russia, like Ireland promoted two years ago, played the tough English side. England played very well from the beginning of the match till the end of the match. England had not many problems with the Russians although after halftime the Russians scored a goal and hoped they would come back in the game. Unfortunately false hope! The last match of the game of the day the host Spain against Belgium, with a full stand of supporters of both teams it was a very exciting game. 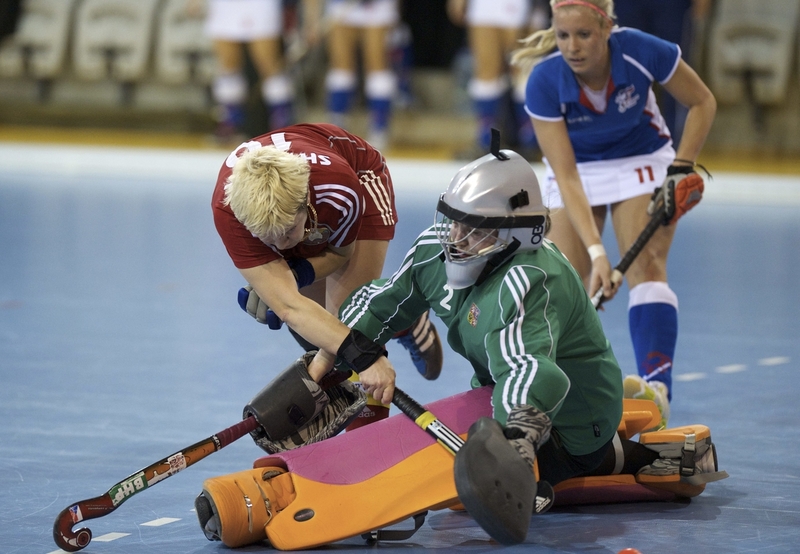 Belgium took the lead in the first half After a stick tackle from Spain in the circle resulted in a penalty stroke. Belgium had no mercy and opened the score. Spain put the pressure in the second half on the defence of Belgium. 3 minutes before the end Spain scored the equalizer. (1-1). A first day under perfect weather circumstances has ended and what will tonight will bring? In the Girls Tournament it started with and early but fabulous sunny day in Santander. We saw Netherlands start their campaign with a resounding 9-2 win against Belgium. The second game was played with equal passion but was a much more closely fought contest. Neither team could gain a strong foothold in the game. France scored in the 30th minute. Although Scotland battled and created chances they just could not convert any into goals. The standing for Pool A are Netherlands, France, Scotland and Belgium. Tomorrow will interesting with Belgium playing Scotland and France playing Netherlands. The third game, the first game in Pool B, saw Germany play Russia. A truly awesome performance by Germany that was very technical and brilliantly executed. Full credit to Russia who did not stop running, their physical fitness is to be applauded. The fourth game of the day saw the hosts play against England. This was always going to be a tough game but ended with honors even. The final standings for Pool B are Germany with Spain and England sharing second place and then Russia.